After J was becoming more obsessed over the Wii U last week, and lots of tantrums when we said no, we allowed her to have an hour on it with Daddy after a party and her swimming lessons, under the pre-tense we WILL be going for a family walk in the afternoon. When it was time to go, I asked her if she wanted to go on her bike, shes not ridden it since Autumn, and even then, it was hardly used. I blame myself as I cant cope on a day out with J, who is not confident nor fast on her bike, but is slowly gaining it. (We have raised her stabilisers a bit, so she still has to try and balance it a bit!) and S who doesn't stop running when you tell her too. 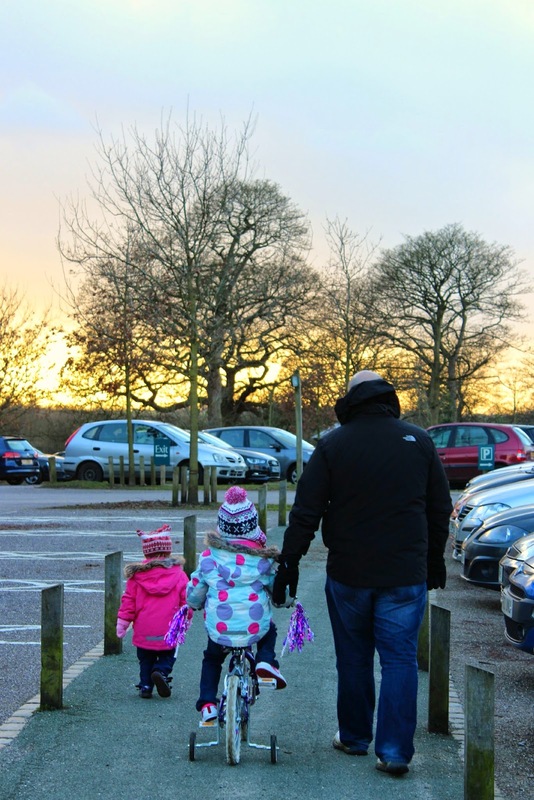 I physically can not go into two, so the bike only comes out when we are out as a family, which hasn't been much recently for bike friendly walks. We decided to go to Dunham Massey, to make the most of our national trust membership. The wind was horrendous, but we wrapped up warm, and J was eager to jump on the bike. To get to the main walking area, we had to go past the duck pond, the girls were upset I didn't bring any bread, so next time, I must remember the bread! The dark clouds were heading our way, but after driving the 40 minutes, we decided to risk it. S was soon running off in front, and Daddy helped reassure the nervous J. The scenery is lovely, no cars around, and so it was safe just to let S run free an burn off her excess energy. J was happy to be outside and on her bike, with no arguments from her, which is a relief! On the way back, with the wind in her face, she wanted to walk the bike back, which she did for a little bit, she then realised it was easier just riding it. J was very cautious of the slopping path, but managed to ride her bike all the way around. We then made it to the park.... S made a beeline for the in built trampolines.... she refused the slides and swings, but loved the trampolines, and the play house underneath the slide. It is such a shame that it was covered in abusive language and graffiti. I'm also extremely relived that J didn't attempt to read it. Why is it that all the "poorer" areas, have really nice parks, and still get ruined, where as more affluent areas, don't really have play parks? J really wanted to go on the "big girls" swings, so I watched her and Daddy from the smaller "little girls" park. It was a lovely family weekend, which didn't cost a penny, but we gained plenty of fresh air. Wow that sounds like a fab weekend and a huge bonus that it was all for free too!! Bless her falling off her bike when it was stationary haha! It's really good that she got back on it again though! Great to have a weekend in the fresh air without it costing a penny! Impressed with your daughter's dedication to getting back on her bike after her fall. Always enjoyable to have fresh air and not spend money, especially at this time of year. What a great weekend for you all, my kids are always difficult to get away from their games consoles and into the fresh air. It's great that you got J out on her bike a bit more, it's always a worry when kids fall off their bikes and could be too scared to get back on so it was great that she not only got back on but wanted to go out again the next day. Thanks for linking up with Country Kids. Looks like a lovely weekend with plenty of fresh air. She did well on her bike, especially after falling off.